the most infrequently updated radiohead news page on the net. guaranteed. if you'd like some real news about radiohead, go to www.ateaseweb.com - they have plenty. head on over to Ebay to bid on Phil Selway's Gold Album awarded to him to celebrate 500,000 copies of the album being sold. profits from the auction will go to The Samaritans and Whizz Kidz. there is also a Kid A print signed by the band in the same lot. 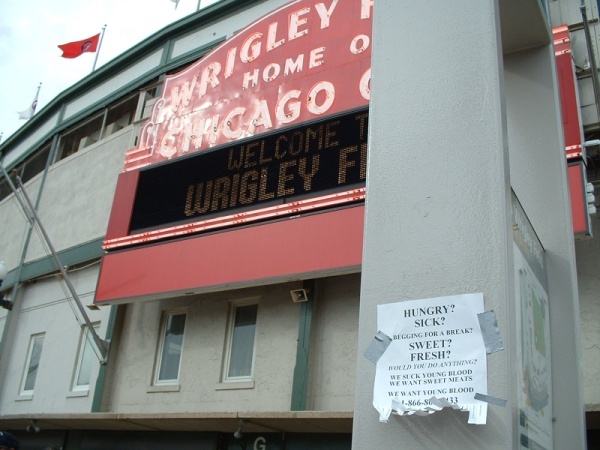 there was another sighting of the ads for Hail to the Thief in Chicago, IL at Wrigley Field (the home of the Chicago Cubs). the picture comes courtesy of yours truly ;) and The Oracle. If you dial 1-866-868-4433 you will reach the Hail to the Thief Customer Care Hotline and you can listen to songs off of Radiohead's new album. The call is toll-free in the US. "yep i was pissed off, but i think the real record will blow the stolen work completely...away. ok i think i should go. lovely lovely double vinyl coming out you see. its going to be LUSH"
copies of the new Radiohead tracks have been leaked on the net. According to the band, these tracks are early versions of the songs on "Hail To The Thief." Read about it more at At Ease. Radiohead will release their sixth album 'Hail To The Thief' on Parlophone on June 9. This will be preceded by the single 'There There' on May 26. 'Hail To The Thief' features 14 tracks and was recorded in Oxfordshire and Los Angeles. It was produced by Nigel Godrich and Radiohead, and mixed by Nigel Godrich. A Punch-Up at a Wedding. The group will play a short tour of the UK and Ireland in May. The seven dates were announced at the weekend through their website www.radiohead.com , and sold out immediately. The tour begins in Dublin on May 17. The group have extensive touring plans for the rest of the year. They will headline Glastonbury on Saturday June 28 and will also be headlining a series of festivals in Europe. Further dates are to be announced. go to the multimedia section of ateaseweb.com to get some mp3's of a few of radiohead's new songs. from what i hear, they'll be playing a lot of new material during their tour. get the mp3's here.